Bull Moose and reflection, Denali National Park, Alaska. 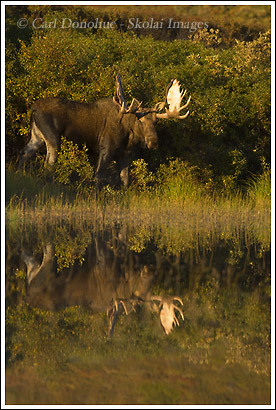 Bull Moose and reflection photo, Denali National Park, Alaska. A bull moose stands with his reflection in a small kettle pond, surrounded by willow bushes, in Denali National Park, Alaska. If you're interested in this photo, please note the "Image Order Number" listed in red BENEATH the image. Thank you.